On the cool Saturday morning of February 15, nine of us huddled around the multi-varietal pear tree. 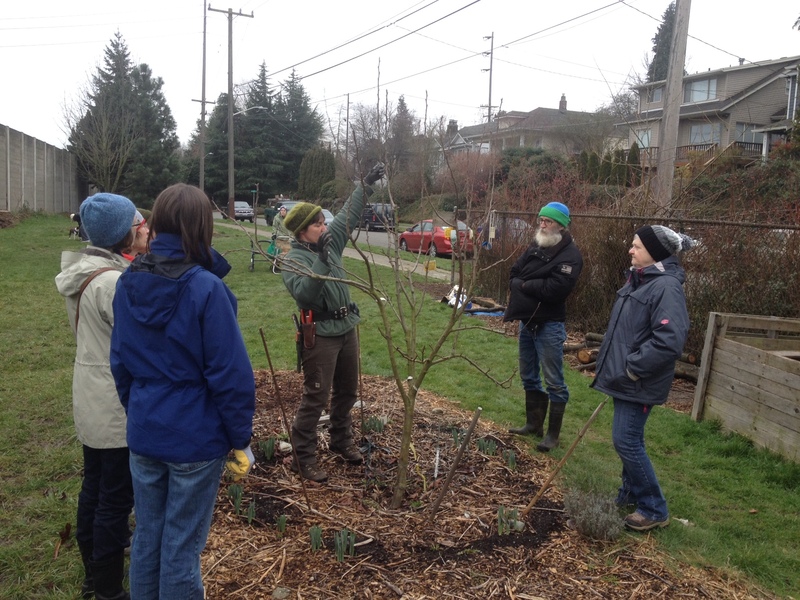 We listened closely, moving from tree to tree, absorbing as much information as we could during the comprehensive pruning class taught by Ingela Wanerstrand. 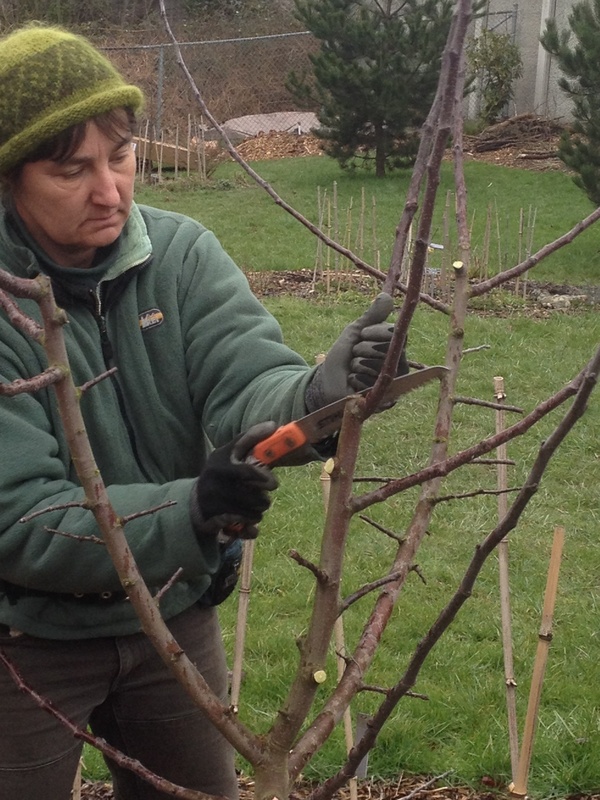 Ingela initially inspected the results of her pruning from the prior year. She was very pleased, mostly with the presence of many fruit buds near to the center of the trees. Taking aim at the blackberries! Come for any amount of time that works for you. Or, bring muffins. 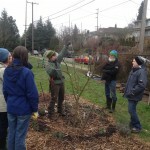 She demonstrated spur pruning, challenges of twisting branches and blind wood, how to work with apical dominance through pruning and bending, the importance of fruit thinning, open vase versus central leader shapes, and tying branches for less or more vigor. The magic is in the way she constantly made decisions about priorities and design. She had a choice of taking out a branch connected to a branch or a branch connected to the trunk and she chose to keep the branch connected to the trunk. 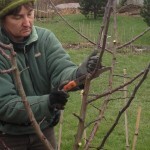 On the multi-varietal pear, she headed back the more vigorous Harrow’s Delight so the other varieties could compete. She chose to head back a branch to another side branch of similar size so as not to create too many water sprouts. We are delighted that Ingela likes to keep coming back! Stay tuned for another class from the master next February. 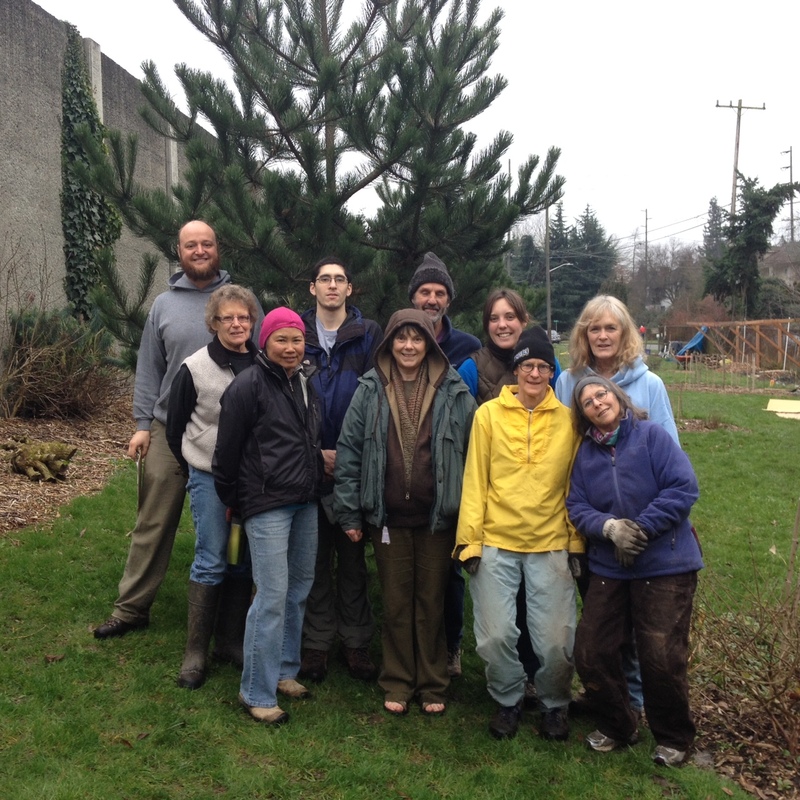 This entry was posted in Plants and tagged blackberries, pruning, strength on February 26, 2014 by Ruth.